"There is nothing worthy of remark either in their architecture or decorations." That was the opinion of Major Jonathan Forbes in his Eleven Years in Ceylon (1840). It's not fair, but there's this much truth in it: the Kandyans in 1800 were no longer building to the standards of their ancestors. We look here at some of their later handiwork and then at the last refuge of their last king. 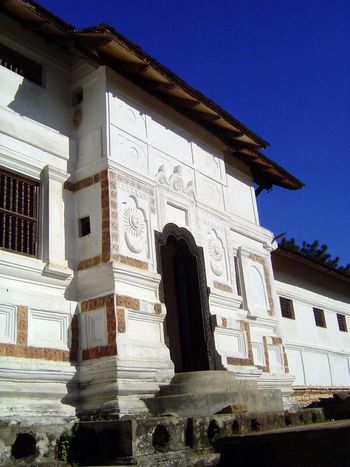 The magulmaduva, or royal council chamber. The portion on the left, with the lower floor, was added by the British in 1875 to accommodate a visit from the Prince of Wales--the columns were taken from another palace building and replaced there by brick. The British eventually restored the original part of the building, too, which was near collapse in the 1920s. In his official diary, Government Agent William Kindersley wrote in March, 1923, that "The Audience Hall remains propped up with jungle posts and is a pathetic sight. 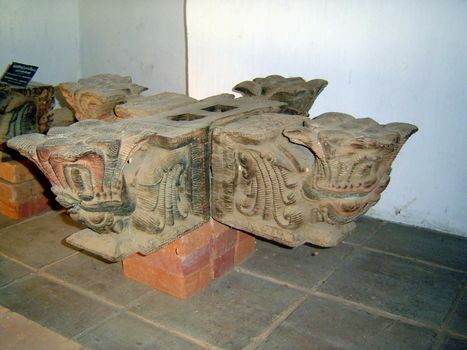 Many of the pillars have so rotted at the base that the pillars have sunk from 1 to 3 inches from the beam that they are supposed to support." 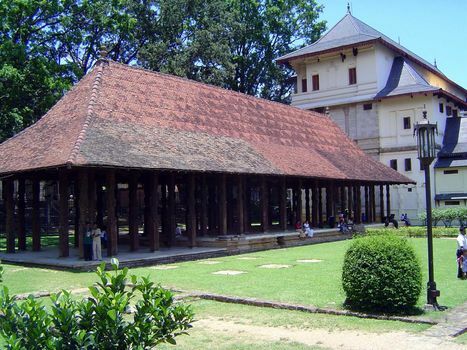 Here's part of the maligawa or royal palace of the last king. 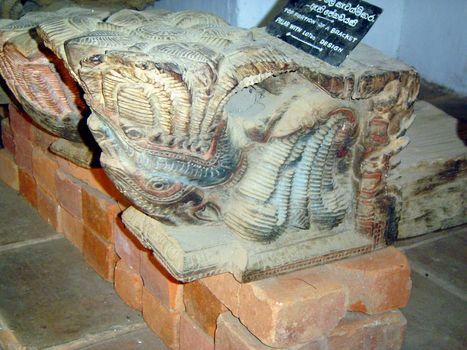 Its relation to the Temple of the Tooth is shown well here, but the picture isn't a fair representation of what the building really looked like, because it's been stripped of the massive veranda that once wrapped it. The veranda kept the facade in deep shade, but this way you can get a sense of the decorative plaster on the brick building. 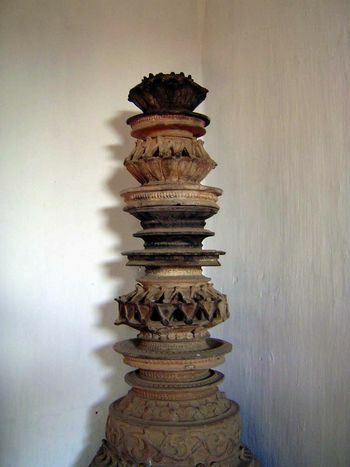 Some parts of the palace are still in use by the government, but this part is now part of the national museum, displaying here an elaborate floor lamp that looks like a timber turned on a lathe but is actually of fired clay. 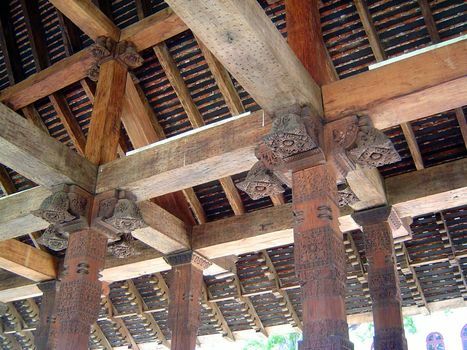 Heavy Kandyan roofs demanded massive columms and beams, once joined with these massive capitals. Doors in a nearby building. We've driven east for about an hour to the small town of Medamahanuwara, then walked for 10 minutes to this stone monument. 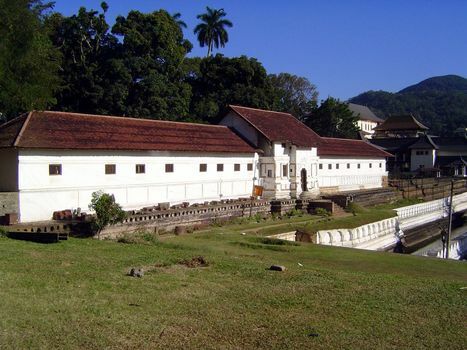 The path is poorly marked, because this isn't a place dear to Kandyan hearts: it's where their last king, fleeing Kandy and seeking refuge, instead surrendered to trackers who turned him over to British captivity. 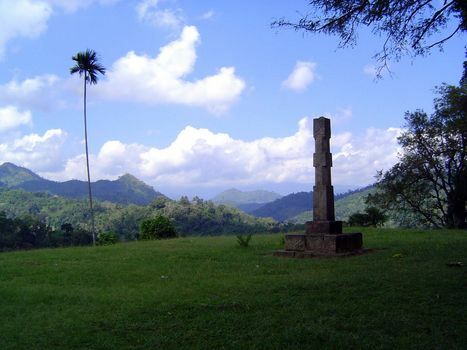 Indeed, were it up to the Kandyans, there would be no monument at all. 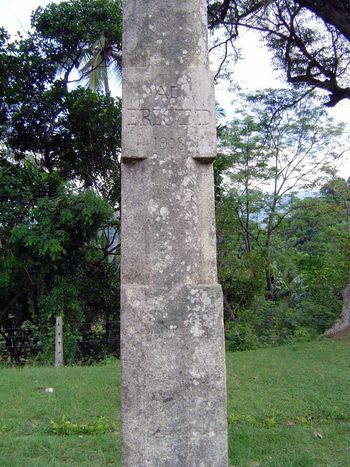 The stone was instead placed by the government agent in Kandy in 1908, almost a century after Sri Wikrama Rajasinha was captured in 1815. He was taken to exile in India, where he died in 1830. 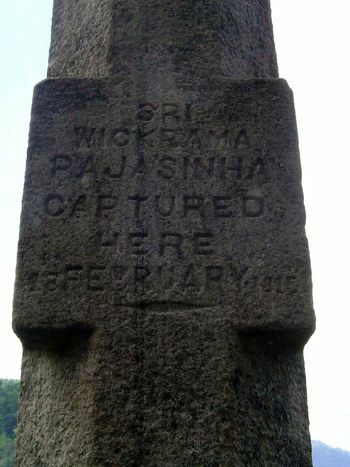 J. Penry Lewis, who erected the monument, quotes a source as follows: "On the following morning the gratifying intelligence was received at Headquarters that the King had been surrounded on the morning of the preceding day (i.e., on February 18, 1815) by some Kandyans of the Province of Dumbara... at a place... very near to Meydemahanoowera." 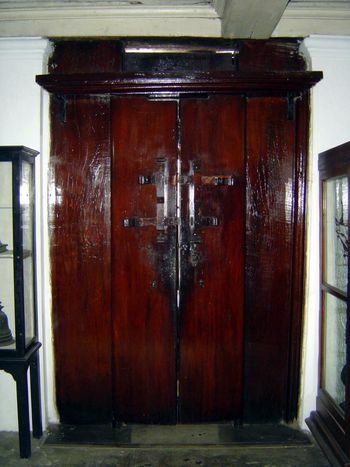 Lewis also quotes from Henry Marshall's Ceylon, which offers these additional details: "It appears that the few Malabar attendants remaining with the King made some resistance, and wounded one of the assailants under the command of Eheylopola, on which the party fired upon the house. The King then appeared and delivered himself up. His pursuers forthwith bound and plundered him of whatever articles of value he had on his person." The king is remembered by Kandyans as a tyrant, which helps to explain why he was captured by his own people. Their commander, Eheylapola, had his own motive: revenge. The king had earlier tried to punish him for insurrection. Failing to capture him, the king had instead ordered the execution of Eheylapola's wife and young children. Their courage facing death is legendary in Sri Lanka today, although the king himself, when assailed by the British for such barbarity, insisted that he had acted according to Kandyan law and custom.